Rev Sally Foster-Fulton said the concept of them and us is a "myth that we can no longer afford to tolerate". At least three million people have been affected and the death toll has risen above 750 as emergency aid is delivered and workers try to restore electricity and water and prevent an outbreak of cholera. Christian Aid is acting as part of the Disasters Emergency Committee (DEC) to raise urgent funds. Mrs Foster-Fulton, a former convener of the Kirk's Church and Society Council, said Scotland can be a "beacon" of hope in the fight for climate justice, which is regarded as one of the defining challenges of the age. 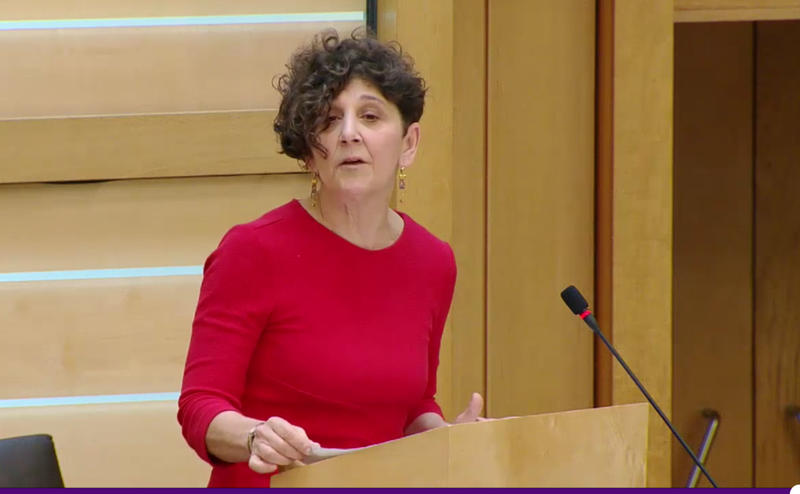 She delivered Time for Reflection today, which heralds the start of the business week at the Scottish Parliament. Here is what the minister said. "Call to mind someone you love. One hundred trillion cells, seven million years of evolution, forty weeks of gestation, years of love and lessons and laughter – tears too no doubt – have gone into that person you brought to mind who holds your heart. Our planet home holds over seven billion souls – every single one a unique one-off-never-to-be-repeated-ever creation. We are over seven billion – and behind every number is somebody’s name; for every statistic, a story, a dream, a purpose. So what if, when asked where we’re from, our first thought wasn’t Edinburgh, Glasgow, South Carolina or Scotland, but ‘I’m a citizen of planet earth, part of a global neighbourhood, intricately inter-related, indivisible. One family – as vast as the ocean, as intimate as a face, a smell, a touch, a look, a feeling. ‘Them and us’ is a myth we can no longer afford to tolerate. Never has it been more important for the world to embrace the truth -no one is an only child. Scotland, though small, can be a beacon: climate justice grounded in ‘not them and us’. Will we stretch for what is necessary rather than settle for what is feasible now? Will we embed policies that cherish those pushed to the margins, even if it means all of us moving over? A small part of something bigger. Thank you for governing us well. When decisions loom, look wide." Last month, the Church of Scotland urged MSPs to commit to delivering a net zero carbon emissions economy by 2050 at the “very latest”. The challenge was issued by Rt Rev Susan Brown, Moderator of the General Assembly, who said the nation must be at the forefront of the ethical and political fight to tackle climate change.